Last night I was preparing to quilt a project using a quilting pattern from a book. Here is my favorite method to do it and if you have never tried it, here is your chance to experiment. 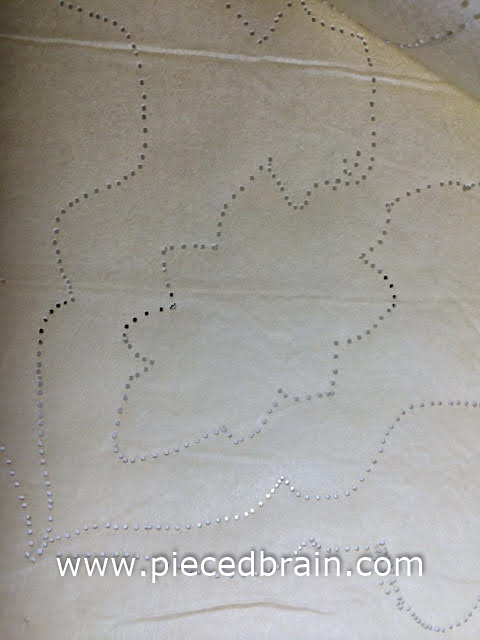 After choosing the quilting motif, I get my roll of Golden Threads quilting paper and trace the design on it with a pencil or fine tipped Sharpie marker. If I only wanted that motif in one block, I would pin the paper onto the block and free motion quilt it. However, I wanted it in four blocks. ... and took the papers to my machine. 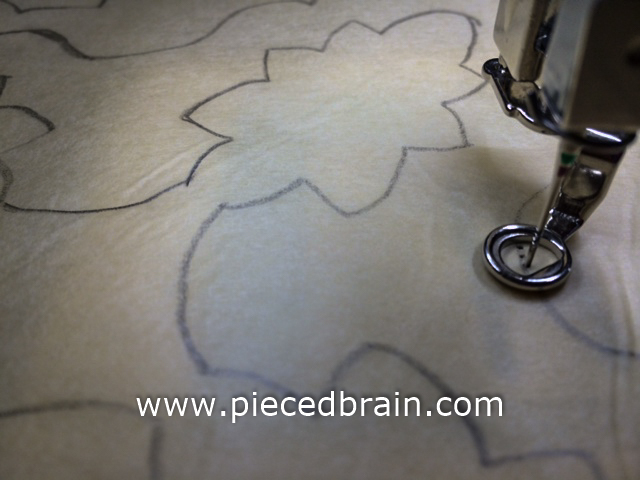 I removed the top and bobbin threads (leave empty bobbin in machine) and free motion quilted the entire design. The needle punches wholes through the layers of papers, 'copying' design onto the other pieces of paper. Easy! Next step is to separate sheets and pin them to blocks. I do pin them all at once, quilt the blocks and remove the paper after every block. This way, if I need to redo something I can do it before I move on to the next block. Do you see the mistake I made when I 'stitched' the design, on the top right corner (bottom of leaf)? No problem. 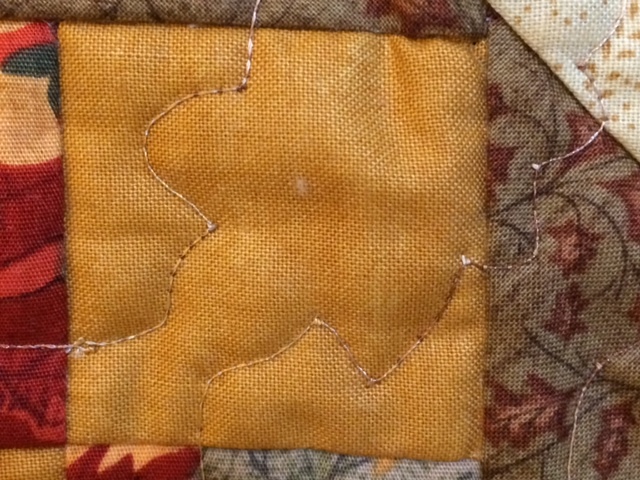 When I actually quilted the block I smoothed that line out. Golden Threads paper is super easy to pull out. If any stubborn pieces remain, just use tweezers to 'pluck' it out. See the tiny pieces of paper at the corners of the design? My trusted tweezers 'operated' on them and they are gone now. I am quilting with a variegated polyester Signature thread (please remind me to NEVER quilt with anything but cotton threads!$%#!!!) which is not as strong as cotton, forcing me to be extra careful when removing the paper - no ripped stitches. What is your favorite way to mark large motifs on quilts? 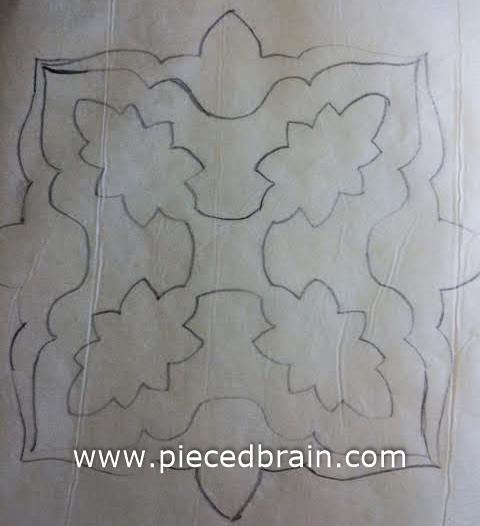 I stop at making one copy of the pattern punched with a needle and then place on block and use pounce and chalk to mark. That way I can reuse the stencil many times! Great tip & tute! Thanks.